In most faith traditions, it is common for the adherents to use the sacred writings of their tradition for purposes of meditation and reflection as well as for community or congregational prayer. As the international interfaith movement grows, it is becoming more common to use sacred texts from several religious traditions in both individual and communal prayer. Multi-faith prayer services are one context that frequently features sacred writings from many religions. This document contains a number of meditation and reflection exercises using various sacred texts. These sacred writings are actually 13 expressions of the Golden Rule as found in a number of faith traditions. To view or download these 13 sacred texts, click here. This listing of texts was originally compiled for inclusion in the Scarboro Missions Golden Rule Poster. Using scripture and symbol, this poster features the Golden Rule in 13 religions. The poster has visual and symbolic power that is useful for both individual and group reflection. The Golden Rule Poster is used as a tool for reflection in all the exercises in Section #3 of this document. All other meditation exercises do not require the use of the poster. 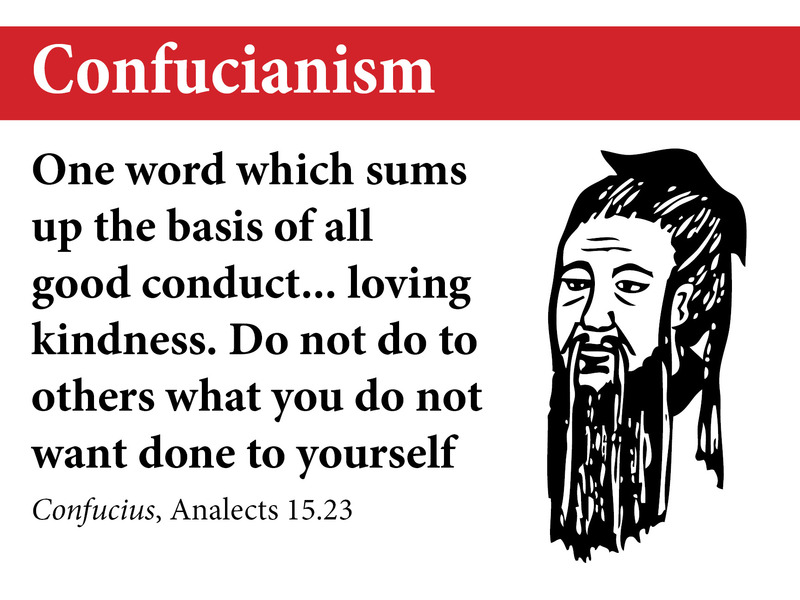 To view or order the Golden Rule Poster, click here. The simplicity, power and universality of the Golden Rule make it an excellent subject for meditation and reflection. 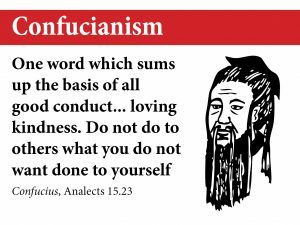 Known also as the Ethic of Reciprocity, the Golden Rule emphasizes values of mutuality, reciprocity and interdependence. Many regard it as the most concise and general principle of ethics. The Golden Rule is arguably the most consistent and most prevalent ethical teaching in history. It is found in numerous cultures, religions, ethical systems, secular philosophies, indigenous (Native) traditions, and even in the mathematical sciences (e.g. the golden mean). And because the Golden Rule crosses so many traditions and philosophies, it possesses tremendous moral authority and reveals a profound unity underlying the diversity of human experience. 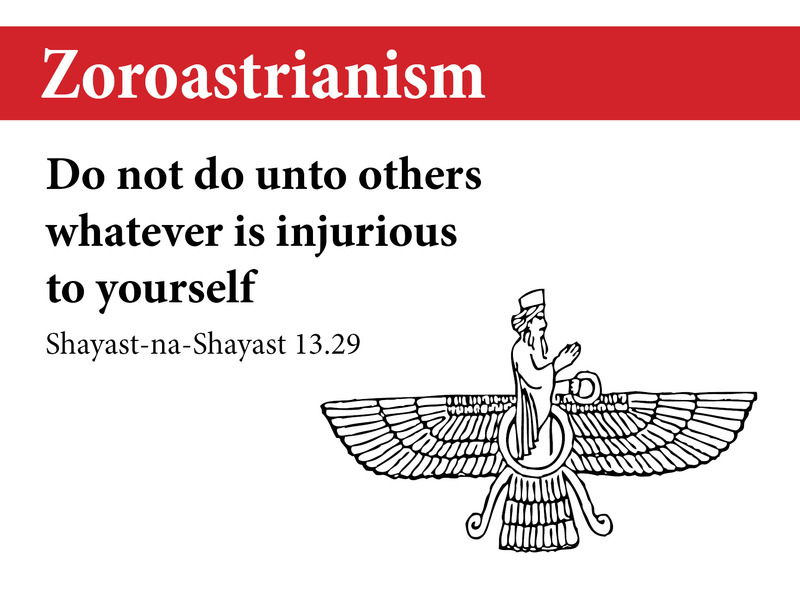 Given its omnipresence across history, the Golden Rule could be described as a universal ethic. In these Golden Rule meditation exercises, participants will thus be reflecting from the perspective of a universal wisdom. 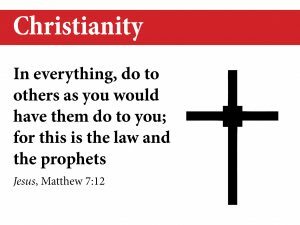 For more information about the Golden Rule, see the Golden Rule Across the World’s Religions section of the Scarboro Missions website. In a noisy, frenetic and fast-paced society, there is little time for quiet, solitude or reflection. As a result, our lives are often lived superficially and we lack adequate occasions for in-depth reflection. For these reasons, the methodology of this document encourages a meditative and contemplative approach to the Golden Rule. 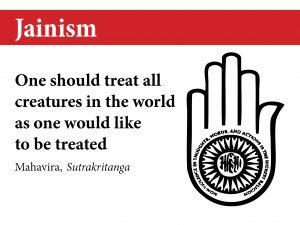 Among the world’s religions there exists a broad range of approaches to ethics, meditation and spirituality. Accordingly, the authors of this document invite various faith groups to adapt or change these meditation exercises as they deem appropriate. 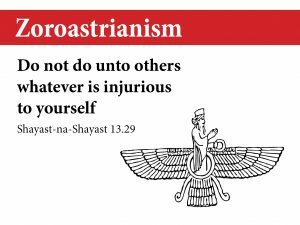 Members of faith traditions other than those represented by the 13 expressions of the Golden Rule in this document should feel free to include an expression of the Golden Rule from their tradition as part of their reflection and meditation. These meditation exercises can be used with single-faith and multi-faith audiences as well as with those who do not identify themselves with any particular faith tradition. A survey of history indicates that there are numerous secular expressions of the Golden Rule; one or more of these can be used in this meditation experience. The exercises presented in this document have been developed for use with adults. But some of these can be adapted for teen and pre-teen audiences. Meditation #2.3 and all the meditations in Section 3 are particularly adaptable for youth. On the Scarboro Missions website, the 13 expressions of the Golden Rule are available in English, French, German, Italian and Spanish. To view or download these various translations, click here. At this time, the meditation exercises are available only in English. But any individual who is fluent in English and one of these languages will be able to use these exercises to facilitate a group reflection with the respective language group. Some of these meditation exercises use the Scarboro Missions Golden Rule Poster as a visual aid for reflection purposes. 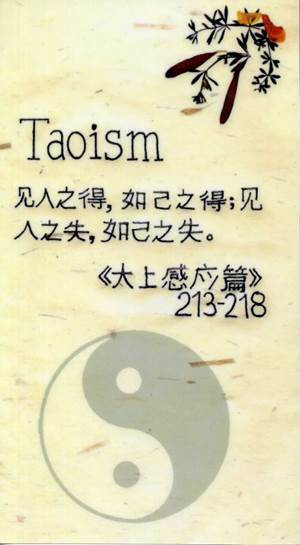 At this time, the poster is printed only in English; but other language groups can use this poster because any meditation can be greatly enhanced by the poster’s physical, visual and symbolic properties. All of these meditation methods, with the exception of Meditation # 2.13, are designed for individual use. But each meditation method contains instructions for a facilitator who wishes to adapt it for a group experience. See Appendix 3: Application to a Group Experience. Individuals are encouraged to determine their own time schedule for these meditations. Experience has demonstrated that a range of 15 to 30 minutes works well for most people. But some individuals prefer a longer period. Facilitators of the group reflections are encouraged to design their own schedules and timelines. Journaling is encouraged in these meditations. Some individuals may prefer to record their reflections during the meditation exercise and some afterward. Individuals who are not comfortable recording their thoughts, learnings and insights on paper are encouraged to employ alternative media such as art, collage and tape-recording. In addition to these meditation exercises, Scarboro Missions has produced Guidelines for a Golden Rule Workshop that enables individuals or organizations to create and facilitate group discussions on the Golden Rule. The workshop is outlined in 13 detailed steps and provides the facilitator with lots of options and themes. Materials required: a listing of the 13 expressions of the Golden Rule. To access this listing, click here. To avoid printing all five available languages, select only the language you need. Prepare yourself for meditation by any means you find to be effective. You may want to consider Appendix 4: Tips for preparing for meditation and reflection. In a slow and reflective fashion, read the 13 expressions of the Golden Rule. Take as much time as you need with these writings. Be sensitive to any words, phrases or particular expressions of the Golden Rule that speak to you. When you feel drawn to a particular word, phrase or expression, stop! Ponder that word, phrase or expression. Say it aloud or silently to yourself several times. Savour the way it sounds or feels in your mouth as you speak it. When you have a sense that you are finished with this particular word, phrase or expression, continue reading and re-reading the 13 versions of the Golden Rule until another word, phrase or expression strikes you or speaks to you. Work with it in the same way as suggested in Steps #3 and #4. Continue with this method of reading and re-reading in a meditative fashion until you sense you are finished for the time being. What was it like for me to do this meditation exercise? At what points during this period of reflection was I moved? Inspired? Challenged? What questions or issues have been raised for me? What new insights have I gained in this process? As a result of this meditation, what aspect of my life might I consider changing? As a result of this meditation, I feel moved to….. In this meditation, what did I learn about the Golden Rule? About the world we live in? For instructions on how to adapt this meditation for a group experience, see Appendix 3: Application to a group experience. Prepare yourself for meditation by any means that you find to be effective. You may want to consider Appendix 4: Tips for preparing for meditation and reflection. Write a brief general statement that captures what you hear being expressed in these 13 sacred writings (e.g. “To me, these writings are saying that…”). Read the various versions of the Golden Rule again. As you reflect on the various expressions of the Golden Rule, what strikes you? What pleasant or unpleasant thoughts, feelings, memories, images or questions come to mind? Listen to your inner reactions (positive or negative) and write them down uncensored. Don’t worry about grammar, spelling or sentence structure. Reflect on what you have written. What connections can you make? What do your spontaneous reactions say to you? What new insights come to you? Write a short paragraph about the main insights you have received in this exercise thus far. Materials required: Sketching paper, crayons, colored pencils and other artistic aids appropriate to the exercise (e.g. clay); a listing of the 13 expressions of the Golden Rule – to access this listing, click here. To avoid printing all five available languages, select only the language you need. Note: You may want to employ other art forms to do this meditation, e.g. dance, physical movement, poetry-writing, story-writing or musical composition. Given the nature of some of these art forms, it may be necessary to adjust some of the following instructions accordingly. As you read, be aware of any image or images that come to mind. Select an image that best expresses your understanding, your sense, your perception or your experience of the Golden Rule. Draw, paint or otherwise create (in clay, collage, dance, music or other medium) your chosen image of the Golden Rule. Feel free to have fun with this exercise – let yourself go! Do things you have not done before!Please note: This exercise is not about artistic talent. It is simply about accessing and expressing your non-verbal, inner reactions to the Golden Rule. A simple stick figure is as adequate as a sophisticated work of art. Resist the temptation to judge your work from an artistic perspective. Having completed your artwork, reflect on what it was like for you to create this non-verbal expression of the Golden Rule. Was it easy? Was it difficult? What feelings were evoked in you? What feelings are present with you now? What did you learn about yourself in this exercise? Did you gain any new insights about the Golden Rule? Jot down your reflections in your journal or on a separate piece of paper. Spend some time gazing at or reflecting on the artwork that you have created. Be present to it. Consider it in all its details. Allow this piece of art to make its way into your heart. Let it impact you. Let it speak to you. Let it do something to you. Jot down in your journal or on a piece of paper what it is that your artwork does or says to you. Again, refrain from judging your work from an artistic perspective. Allow yourself to savour this creative experience. Individuals work separately and in silence, making their way through the above six steps under the guidance of the facilitator. After completing Step #6, individuals work in pairs or groups of three sharing the images (or artistic expressions) they have created and the insights they have gained during this exercise. Participants are encouraged to share as much as they feel comfortable sharing. Participants can also share their written reflections with one another, although the right to privacy in this regard must be emphasized and respected. Next, some of these images and insights can be shared and discussed in a plenary session that includes all participants. The plenary session could take the form of a Golden Rule art gallery in which the various images are exhibited and explained. Or a Golden Rule recital featuring, for example, musical and dance performances. Or a story-telling session. The facilitator is responsible for providing required materials and for creating and managing the schedule of this group meditation. The facilitator is free to make adaptations to the activity schedule suggested here. A Shinto wisdom statement“The heart of the person before you is a mirror; see there your own form.”Shintoism is the indigenous religion of Japan. 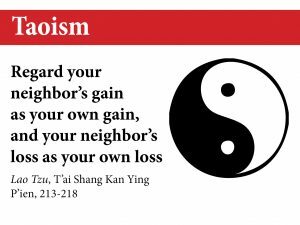 Spend time reflecting on this Shinto wisdom statement. Take as much time as you need. 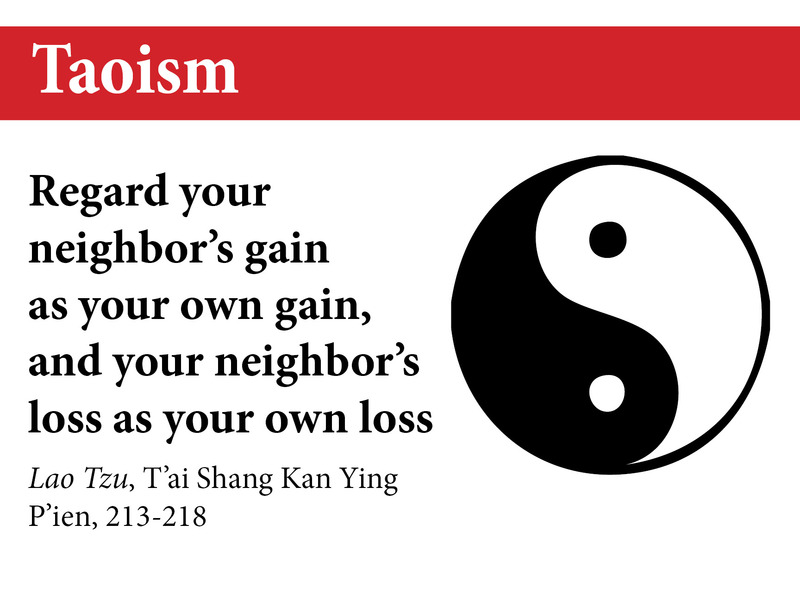 Does the Shinto wisdom statement give added meaning to the 13 expressions of the Golden Rule? If so, how does it add meaning? Conversely, do the 13 statements of the Golden Rule give added meaning to the Shinto statement? Explain. Which of the 13 expressions of the Golden Rule relate most directly to the Shinto statement? Explain. Are there ways in which the Shinto statement does not relate to the 13 expressions of the Golden Rule? Explain. In your own words, re-write the Shinto wisdom statement, incorporating any new insights that you have garnered from your reflection thus far. As a result of this meditation, what aspects of my life might I consider changing? As a result of this meditation, I feel moved to…. What did I learn about the Golden Rule? About the world we live in? In your journal, record any thoughts, reflections or insights garnered in Step #6 and in the entire process. Compassion and healing“It is compassion that heals us. Compassion – the sense of shared humanity, the sense of our kinship with each other – this is what heals. This is what heals the desperation that we feel, the darkness that we feel.”Spend time reflecting on this statement by Pema Chodron in which she makes a connection between compassion and healing. Pema Chodron is a Buddhist nun and teacher who lives in Nova Scotia, Canada. In her teaching she often focuses on the practice of compassion, a key tenet of Buddhism. Take as much time as you need to reflect on Chodron’s statement. Does Pema Chodron’s statement give added meaning to the 13 expressions of the Golden Rule? If so, how does it add meaning? Conversely, do the 13 statements of the Golden Rule give added meaning to Chodron’s statement on compassion? Explain. Which of the 13 expressions of the Golden Rule relate most directly to Chodron’s statement? Explain. Are there ways in which Chodron’s statement does not relate to the 13 expressions of the Golden Rule? Explain. In your own words, re-write Pema Chodron’s statement on compassion and healing, incorporating any new insights that you have garnered from your reflection thus far. What did I learn about the Golden Rule? About compassion and healing? About the world we live in? The words of Gandhi“You must be the change you want to see in the world.”Spend some time reflecting on these words of Mahatma Gandhi (1869-1948). This statement from the great Hindu saint and apostle of non-violence is typical of Gandhi who challenged people to move from talk to action, to find the courage to improve their society by becoming the best person they can be.Feel free to take as much time as you need to reflect on these words of Gandhi. 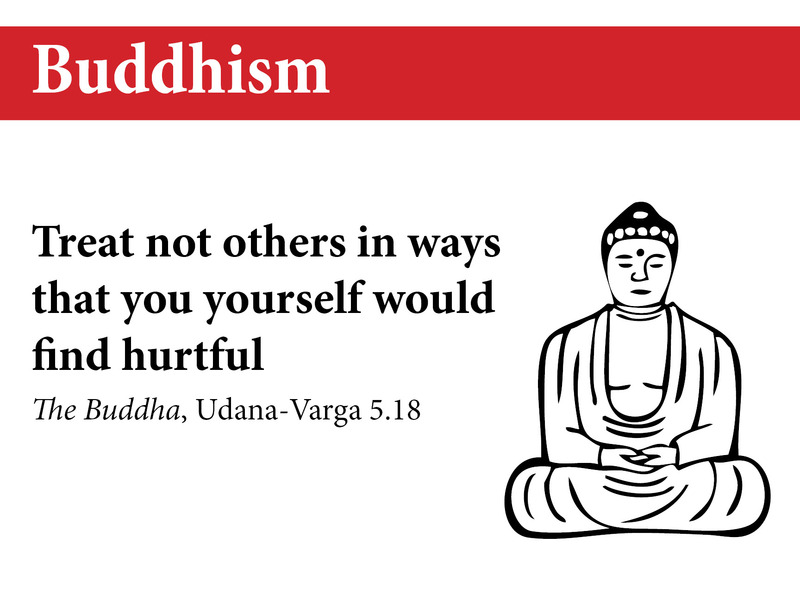 Do Gandhi’s words give added meaning to the 13 expressions of the Golden Rule? If so, how do they add meaning? Conversely, do the 13 expressions of the Golden Rule give added meaning to Gandhi’s statement? Explain. Which of the 13 statements of the Golden Rule relate most directly to Gandhi’s words? Explain. Are there ways in which Gandhi’s statement does not relate to the 13 expressions of the Golden Rule? Explain. In your own words, re-write the Gandhian statement, incorporating any new insights that you have garnered from your reflection thus far. What did I learn about the Golden Rule? About the world we live in? About changing the world we live in? There is only one of us”.Spend some time reflecting on this statement, which is one of a number of ways of expressing the HinduNamaste greeting. It is common for Hindus to greet one another with the Namaste gesture. Bringing the palms of the hands together in a prayer position in front of the chest, they bow to one another while saying the word “Namaste”. The bowing of the head is a gracious form of extending friendship in love and humility. The bow also symbolizes the negation or reduction of one’s ego in the presence of another. By way of thisNamaste greeting, Hindus recognize the presence of the divine in one another and in all of creation.Spend as much time as you need reflecting on these words associated with the Hindu greeting. Do the words of the Hindu Namaste greeting give added meaning to the 13 expressions of the Golden Rule? If so, how do they add meaning? 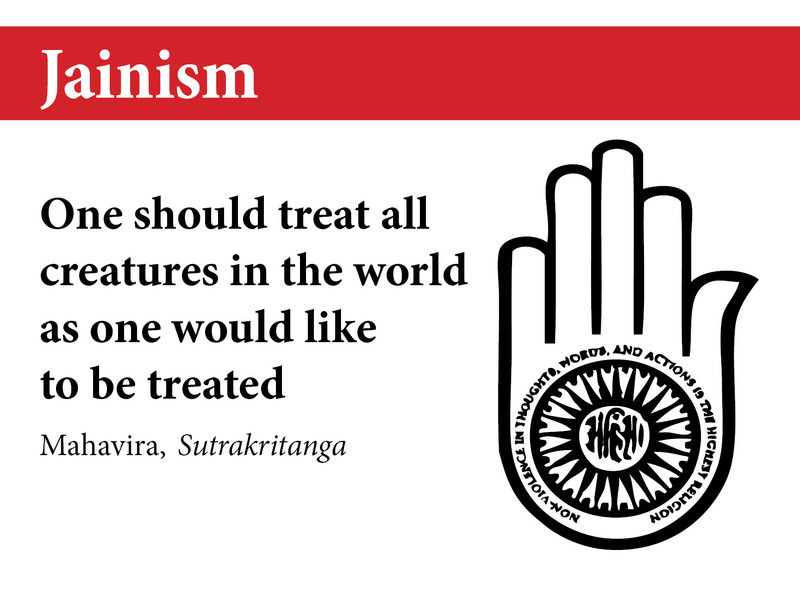 Conversely, do the 13 expressions of the Golden Rule give added meaning to the Hindu greeting? Explain. Which of the 13 statements of the Golden Rule relate most directly to the words of the Namastegreeting? Explain. 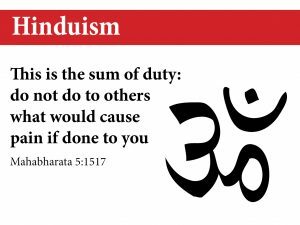 Are there ways in which the words of the Hindu greeting do not relate to the 13 expressions of the Golden Rule? Explain. In your own words, re-write the words of the Namaste greeting, incorporating any new insights that you have garnered from your reflection thus far. In your journal, record any thoughts, comments or insights garnered in Step #6 and in the entire process. 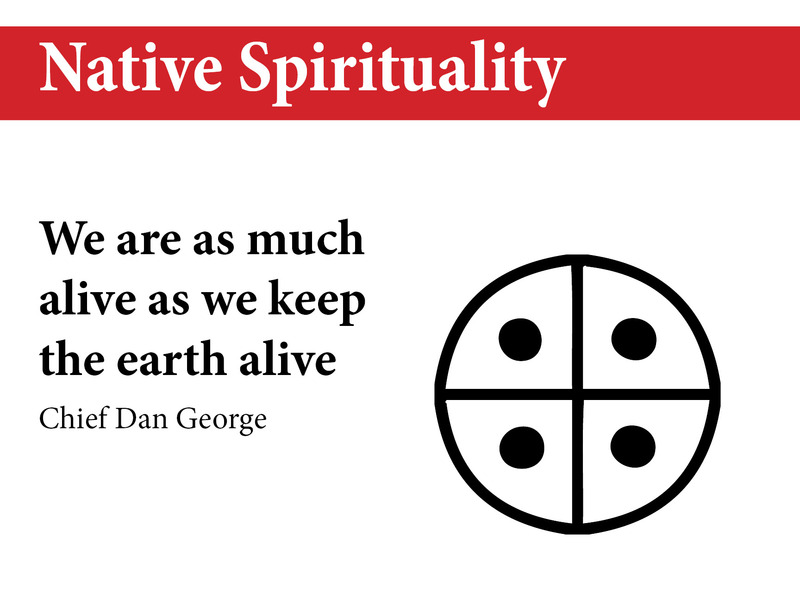 Black Elk’s teaching“All things are our relatives; what we do to everything, we do to ourselves. All is really One.”Spend some time reflecting on these words of Black Elk (1863-1950). An Oglala Sioux (Lakota), Black Elk was a visionary and shamanic healer in the Native American tradition. Many of his teachings and visions are captured in Black Elk Speaks, a book of his teachings which offers an eloquent and profound vision of the unity of all creation.Spend as much time as you need reflecting on these words of Black Elk. Do these words of Black Elk give added meaning to the 13 expressions of the Golden Rule? If so, how do they add meaning? Conversely, do the 13 expressions of the Golden Rule give added meaning to Black Elk’s words? Explain. Which of the 13 statements of the Golden Rule relate most directly to Black Elk’s teaching? Explain. Are there ways in which the words of Black Elk do not relate to the 13 expressions of the Golden Rule? Explain. In your own words, re-write this statement by Black Elk, incorporating any new insights that you have garnered from your reflection thus far. Reflecting on “separateness” and “interconnectedness”“We are here to awaken from the illusion of our separateness…”Spend some time reflecting on these words of Thich Nhat Hanh. Thich Nhat Hanh is a Vietnamese Buddhist monk and a renowned teacher, writer and peace activist. His efforts in resisting the Vietnam War inspired Martin Luther King Jr. to nominate him for the Nobel Peace Prize. He has championed a movement called “engaged Buddhism” which seeks to integrate traditional meditative practices with social justice activity.The Buddha taught that all things are interdependent. Accordingly, the Buddhist path involves an awakening to a consciousness of this interconnectedness. From a Buddhist perspective, this involves an awakening from the illusion that we, as individuals, are independent and separate from other facets of reality (including other beings).Take as much time as you need to reflect on this statement by Thich Nhat Hanh. Do these words of Thich Nhat Hanh give added meaning to the 13 expressions of the Golden Rule? If so, how do they add meaning? 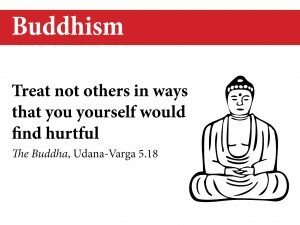 Conversely, do the 13 expressions of the Golden Rule give added meaning to this Buddhist monk’s words? Explain. Which of the 13 statements of the Golden Rule relate most directly to Thich Nhat Hanh’s words? Explain. Are there ways in which these words of Thich Nhat Hanh do not relate to the 13 expressions of the Golden Rule? Explain. In your own words, re-write Thich Nhat Hahn’s statement, incorporating any new insights that you have garnered from your reflection thus far. The wisdom of Mother Teresa“If we have no peace, it is because we have forgotten that we belong to each other.”Spend some time reflecting on these words of Mother Teresa (1910-1997). This Roman Catholic nun attained international recognition for her work among the poor and dying of India. Known as “the saint of the gutters,” she taught and practiced an ethic of radical service to the poorest members of society.Spend as much time as you need reflecting on these words of Mother Teresa. Do these words of Mother Teresa give added meaning to the 13 expressions of the Golden Rule? If so, how do they add meaning? Conversely, do the 13 expressions of the Golden Rule give added meaning to Mother Teresa’s words? Explain. Which of the 13 statements of the Golden Rule relate most directly to Mother Teresa’s statement? Explain. Are there ways in which the words of Mother Teresa do not relate to the 13 expressions of the Golden Rule? Explain. In your own words, re-write this statement by Mother Teresa, incorporating any new insights that you have garnered from your reflection thus far. What did I learn about the Golden Rule? What did I learn about the world we live in? About caring for the poorest people in our world? About bringing peace to our world? 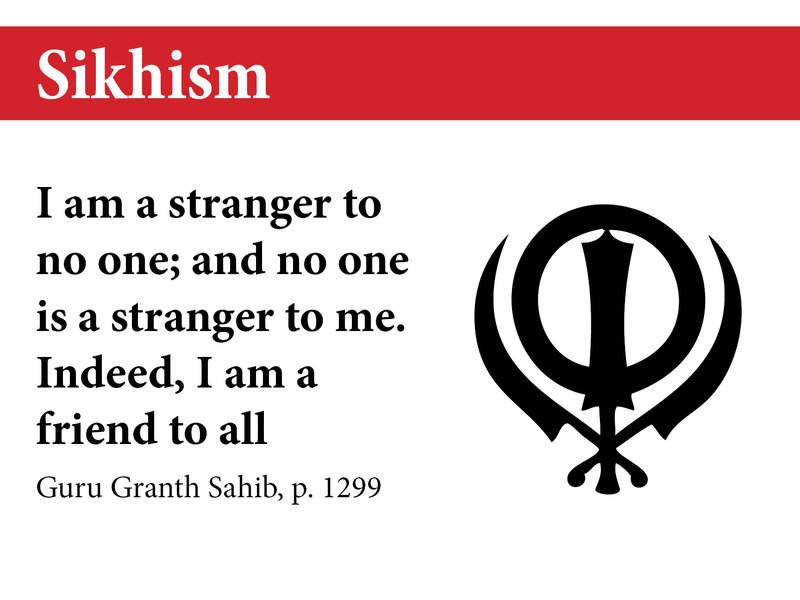 Interfaith dialogue“It seems to me that the world’s religions are like siblings separated at birth. We’ve grown up in different neighbourhoods, different households, with different songs, stories, traditions and customs. But now we’ve been reunited, and, having found each other after so many years apart, we look into each other’s faces and can see the family resemblance. We’re back together again, and it’s very good.”Spend some time reflecting on these words of Richard Watts, an interfaith activist and Presbyterian minister living in the United States. 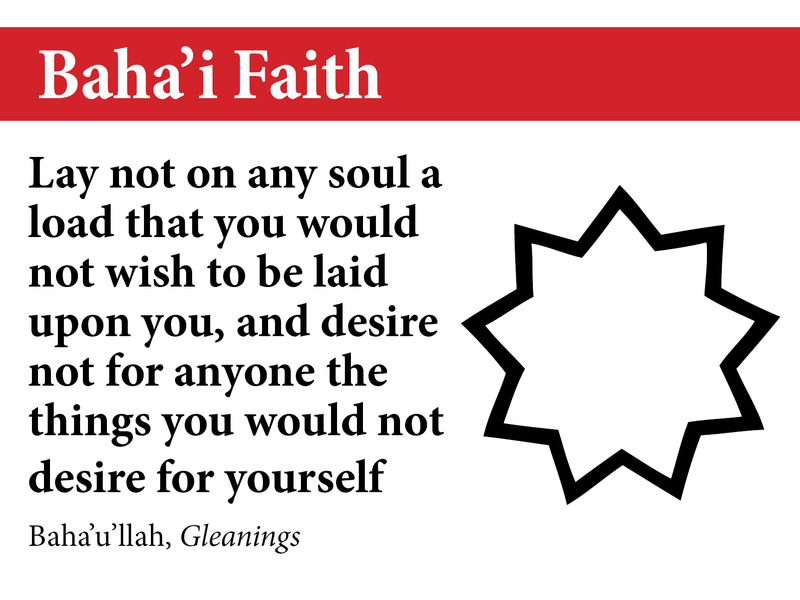 This eloquent statement captures the sentiments of many people involved in the international interfaith movement. Our shrinking global village is becoming a multi-religious society. Today we are witnessing levels of conversation and cooperation among the world faiths that are strikingly new to history. In fact, the world’s religions are now cooperating on every conceivable issue.Take as much time as you need to reflect on these words of Richard Watts. 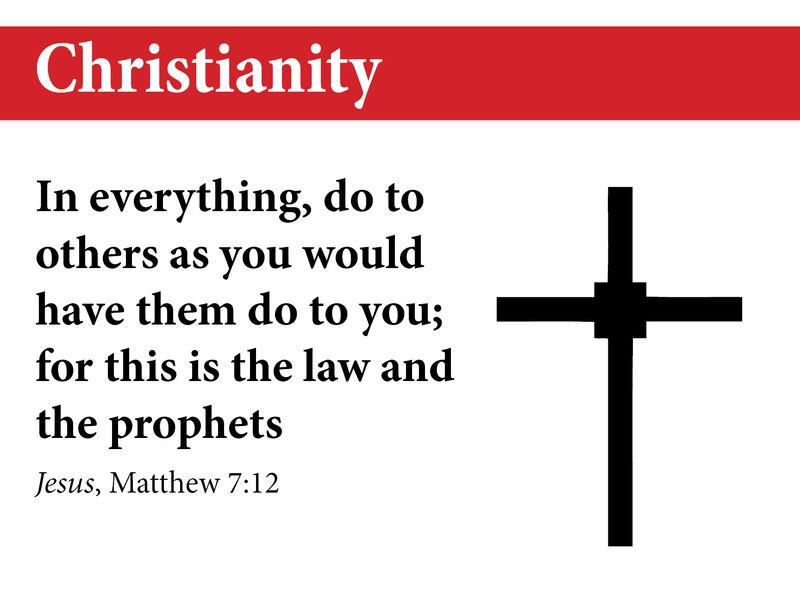 Do these words of Richard Watts give added meaning to the 13 expressions of the Golden Rule? If so, how do they add meaning? Conversely, do the 13 expressions of the Golden Rule give added meaning to Watts’ words? Explain. Which of the 13 statements of the Golden Rule relate most directly to Richard Watts’ statement? Explain. Are there ways in which Watts’ words do not relate to the 13 expressions of the Golden Rule? Explain. In your own words, re-write this statement by Richard Watts, incorporating any new insights that you have garnered from your reflection thus far. What did I learn about the Golden Rule? About the world we live in? 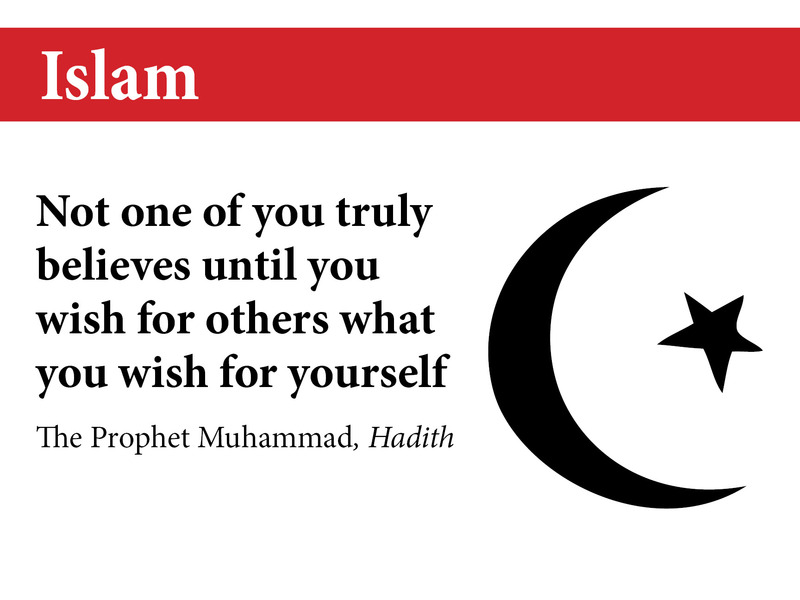 About interfaith dialogue? Is there gold in those words? Spend some time reading and reflecting on the article entitled “Discovering the ‘gold’ in the Golden Rule”.This article focuses on the symbolic power of gold and its universal appeal across history. In many languages, gold functions as a metaphor for what is most valued in human experience. As a medium of exchange, gold has often functioned as a universal standard. Interestingly enough, gold has also managed to symbolize a universal ethical standard (e.g. the Golden Rule). Take as much time as you need to reflect on this article. Does the article on gold give you a deeper understanding of the Golden Rule? Explain. Which of the 13 versions of the Golden Rule relate most directly to the content of the article on gold. Explain. Can you make a connection between the “value” found in the Golden Rule and the symbolic “value” of gold as expressed in the article? Explain. Are there ways in which the article on gold does not relate to the 13 Golden Rule statements? Explain. How do you understand the “gold” in the Golden Rule? Given your reflections thus far, how do you now interpret the meaning of the “gold” in the Golden Rule? Compose a brief summary statement that captures this meaning for you. What did I learn about the Golden Rule? About gold and its symbolic meaning? What did I learn about the world we live in? All participants are seated in a circle (if possible). The process begins with two to five minutes of silence, each person preparing her/his heart to be open and receptive. In a slow and reflective fashion, the facilitator reads aloud all 13 expressions of the Golden Rule. Participants are invited to listen attentively and silently, being sensitive to any word or phrase that speaks to them. In a slow and reflective fashion, the facilitator reads aloud the 13 expressions of the Golden Rule a second time. Participants again listen reflectively for a word or phrase that strikes them. After this second reading, the facilitator invites those individuals who wish to say aloud the word or phrase from the 13 writings that most speaks to them. The other participants simply listen while the word/phrase is spoken. Slowly and reflectively, the facilitator reads aloud the 13 expressions of the Golden Rule a third time. Next, the facilitator invites a comment from those who in Step #3 shared a word/phrase. These individuals are invited to share as to why this particular word or phrase is significant for them. During this sharing, the other participants listen respectfully without crosstalk, discussion or feedback. The session closes with a two-minute period of silence. The facilitator then invites the participants to offer one another some sign of friendship, e.g. a handshake, hug, bow or whatever gesture is appropriate. This section features a number of meditation exercises; each of these focuses on the Scarboro Missions Golden Rule Poster which is rich in visual and symbolic meaning. The purpose of these meditations is to reflect on the meaning of the Golden Rule against the backdrop of the physical, symbolic and visual properties of the poster. 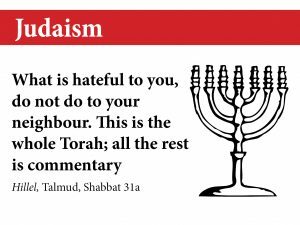 The Golden Rule Poster does not, of course, contain all the world’s spiritual, cultural and religious traditions (which is a mathematical impossibility given the countless number of such traditions in our world). Accordingly, the poster is indicative but it is not meant to be exhaustive. It does have an inclusive quality but in a symbolic way. The poster is a symbol in that it points the viewer to something bigger than itself, something beyond itself and to a more inclusive vision of the world. 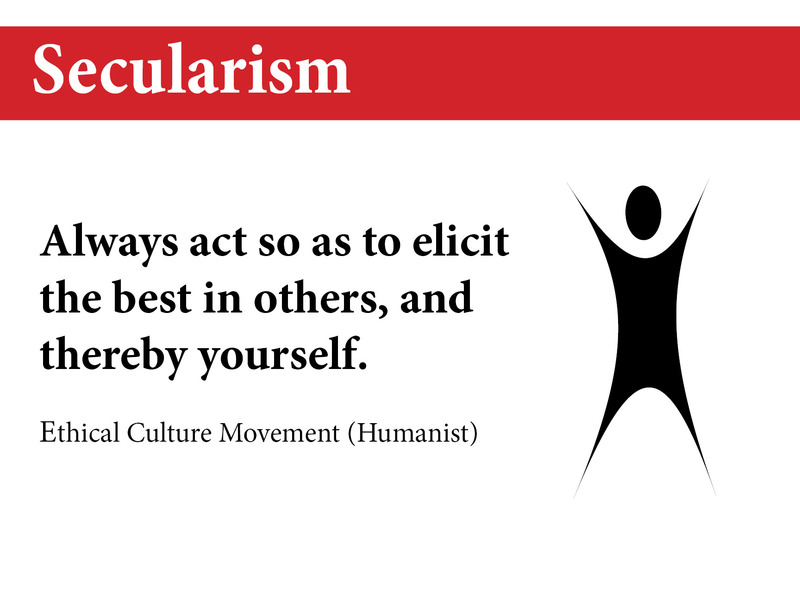 Similarly, the poster does not contain all of the innumerable versions of the Golden Rule, including secular versions. But it does remind the viewer of the universality of the Golden Rule. In this way, the poster has a capacity to create a consciousness in the viewer that is broader, more pluralistic and more open. The various meditation exercises featured below are designed for individual use but can be adapted for a group experience. For instructions on how to adapt these meditations for a group experience, see Appendix 3: Application to a group experience. As an aid to those who want to facilitate this meditation in a group setting, see Appendix 1: Comments about the Golden Rule Poster; this appendix contains comments about the design of the poster by individuals who viewed the poster for the first time. Some of these comments refer to the poster as a symbol for global human community. Some of the content of the following meditation exercises can easily be adapted to a classroom or youth education program. Scarboro Missions Golden Rule Poster. To view or order poster, click here. A listing of the 13 expressions of the Golden Rule. To access this listing, click here. To avoid printing all five available languages, select only the language you need. For meditation exercise #3.6: “One family, one world”, pen/pencil and paper are required. Spend some time gazing at the Golden Rule Poster. Allow it to speak to you. Study the visual elements of the poster – its overall design, its various shapes, lines, colours. Consider how these various elements relate to one another. Reflect on the symbolic meaning of the poster image. What was it like for me to do this meditation? At what points during this meditation was I moved? Inspired? Challenged? What new insights have I gained? 3.3 The Golden Rule: A universal principle? Re-read the 13 writings noting similarities and differences in the content and meaning of the various expressions. Do you see one universal principle or theme underlying the 13 writings? If so, what is it? Jot it down on paper. Perhaps you see more than one universal theme or principle. Spend time gazing upon the poster as an image. Allow it to speak to you. Study the visual elements of the poster – its overall design, its various shapes, lines, colours. Consider how these various elements relate to one another. Reflect on the symbolic meaning of the poster image. If in Step #3 you identified one underlying theme running through the 13 writings, do you see the poster as a symbolic expression of this one universal principle? Explain. Spend time gazing upon the poster as an image. Allow it to speak to you. Study the visual elements of the poster – its overall design, its various shapes, lines, colours. Consider how these various elements relate to one another. Reflect on the symbolic meaning of the poster. Turn again to the poster. As you continue to gaze reflectively upon its various visual qualities, what feelings are evoked in you? What images are evoked for you? What do these feelings or images say to you about yourself? About the Golden Rule? About the world we live in? Do you see a relationship between any or all of the 13 writings and any or all of the three principles listed above? Explain. Do you see any connection between the physical features of the poster and the principles listed above? Explain. What did I learn about the Golden Rule? About the world we live in? 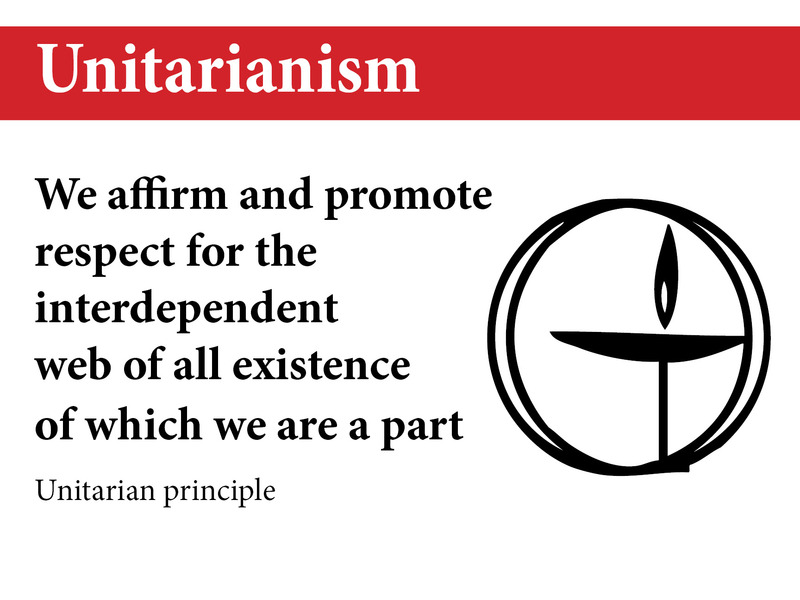 About universal principles? In a slow and reflective fashion, read the 13 versions of the Golden Rule. Take as much time as you need with the writings. Some people claim that a key underlying assumption of the Golden Rule is the unity and interconnectedness of all persons. Accordingly, spend some time imagining what it would be like for the human race to be “one family in an interdependent and harmonious universe.” Don’t worry about being practical. Be as creative and imaginative as you wish. Jot down your thoughts in your journal. Draw an image or a picture of the human race as “one family in an interdependent and harmonious universe.” Use whatever shapes, colours and lines you wish. Feel free to have fun with this exercise – let yourself go! Do things you have not done before!Please note: Don’t worry about being an artist. This exercise is not about artistic talent. It is simply about accessing and expressing your non-verbal inner creativity. A simple stick figure is as adequate as a sophisticated work of art. Resist the temptation to judge your work from an artistic perspective. Having created your image, reflect on what it was like for you to create this piece of art. Was it easy? Was it difficult? What feelings were evoked in you? What feelings are present with you now? What did you learn about yourself in this exercise? Jot down your thoughts. Spend some time gazing directly at the image you have created. Be present to it. Consider it in all its details. Allow this image to make its way into your heart. Let it impact you. Let it speak to you. Let it do something to you. Jot down in your journal what it is that your image does or says to you. Again, refrain from judging your work from an artistic perspective. Spend time gazing upon the Golden Rule Poster. Allow it to speak to you. Study its various visual elements – its overall design, its shapes, colours, lines. Consider how these various elements relate to one another. Reflect on the symbolic meaning of the poster image. Note, for example, that the lines of latitude and longitude on the globe connect the various continents to one another in a single global human community. Observe, on the other hand, that there are no lines dividing the various continents into nations. Note also that the symbols of the various religions are gathered in a circle of circles – the circle is the most universal of religious symbols and represents unity and interconnectedness – in the circle, “everything is connected and everything is one”. Ask yourself, “In what ways does your own artistic creation give further depth and meaning to the Golden Rule Poster?” “In what ways does the Golden Rule Poster give more depth and meaning to your art creation?” “In what ways do the poster and your own artistic creation deepen your understanding of the Golden Rule?” Jot down your thoughts. What did I learn about myself? About my artistic expression? What did I learn about myself as a member of the global human family? In a slow and reflective fashion, read the 13 versions of the Golden Rule. Take as much time as you need with these writings. Spend time gazing upon the poster as an image. Allow it to speak to you. Study the visual elements of the poster – its overall design, its various shapes, lines, colours. Consider how these elements relate to one another. Reflect on the symbolic meaning of the poster image. Note that there are a number of circles on the poster. In fact, the poster contains a circle of circles. At the centre of the poster there resides a circle-the earth. Note also that the various symbols representing the 13 spiritual traditions are contained in circles. In fact, some of the symbols are themselves circles or contain partial circles. Observe also that the poster could be conceived as a wheel with numerous spokes going out from the central hub which is the globe (and which has the words “The Golden Rule” superimposed on it). Spend a few minutes reading and reflecting upon the article “Understanding the Circle” found in Appendix 2 of this document.The circle is one of the most prevalent symbols in history and is found in every religion and culture. The circle has multiple levels of meaning; it is first of all a symbol of unity and interconnectedness – in the circle “everything is connected and everything is one.” This article examines many of the numerous levels of meaning associated with the circle.Take as much time as you need reflecting on this article. Having reflected on the meaning of the circle, turn again to the poster and spend time gazing at it. Take note again of the many circles on the poster. How do the circles and the pattern of circles on the poster speak to you about the deeper meaning of the Golden Rule? Jot down your thoughts. What did I learn about myself? About the circle? For instructions on how to adapt this meditation for a group experience, see Appendix 3: Application to a group experience.For the plenary session of this experience, the facilitator is encouraged to have the participants sit in a circle. In a slow and reflective fashion, read the 13 versions of the Golden Rule. Take as much as you need with these writings. the globe – the earth – our world – resides at the very centre. the words, “The Golden Rule”, are superimposed on the globe. lines (or rays) flow out from the globe to the outer edges of the poster and beyond (or, from another perspective, the lines flow from the outer edges inwards toward the globe). on the globe at the centre, the lines of longitude and latitude connect the various continents to one another in one single global human community. there are no lines dividing the various continents into nations. the poster can be conceived as a wheel with numerous spokes going out from the central hub which is the globe. the symbols of the various religions are gathered in a circle of circles – the circle is the most universal of religious symbols and represents unity and interconnectedness – in the circle, “everything is connected and everything is one”. Spend a few minutes reading and reflecting on the article entitled “The Golden Rule and the Global Ethic”The Global Ethic is an international effort to develop a set of universal moral principles that calls upon the wisdom of the world’s many cultures, religions and secular philosophies. Because the Golden Rule is found in so many religions and cultures, it is a key moral ingredient in the development of a Global Ethic.Take as much time as you need reflecting on this article. Turn again to the Golden Rule poster. As you continue to gaze upon the poster image, what connections can you make between the Global Ethic, the Golden Rule and the design of the poster? Does the poster inspire or challenge you to become a truly global citizen? Jot down your thoughts. What was it like for me to do this reflection? What did I learn about the world we live in? About the Global Ethic? About global citizenship? Spend time gazing upon the Golden Rule Poster as an image. Allow it to speak to you. Study the visual elements of the poster – its overall design, its various shapes, lines, colours. Consider how these various elements relate to one another. Reflect on the symbolic meaning of the poster image, particularly from the perspective of the growing levels of interfaith cooperation around the world. 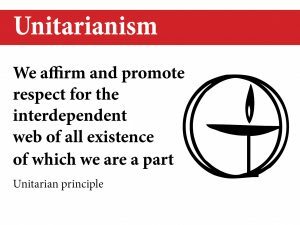 As a result of broad-based immigration patterns, more and more regions of the world are becoming environments of multi-culture and multi-faith; our shrinking global village is becoming a multi-religious society in which we are witnessing the emergence of a global interfaith consciousness. Research demonstrates that the religions of the world are now cooperating on every conceivable issue.Keep in mind also that an expression of the Golden Rule can be found in virtually all of the world’s religions. Indeed, the Golden Rule is considered to be a key point of agreement – and thus a key focus of dialogue – among the world’s many faiths. To you, does the poster convey a message of global interfaith cooperation? Explain. the poster can be conceived as a wheel with numerous spokes going out from the central hub, which is the globe. 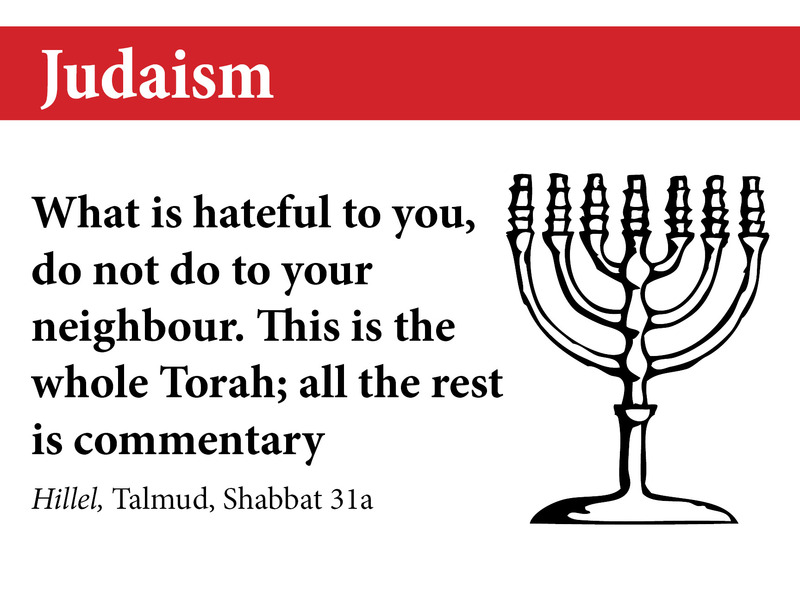 As you continue to gaze upon the poster image, what connections can you make between the Golden Rule, the design of the poster and the growing international phenomenon of interfaith dialogue? Does the poster inspire or challenge you to become more committed to interfaith dialogue? Jot down your thoughts. What did I learn about the possibilities for interfaith dialogue in my community and around the world? The circle is the most universal of religious symbols. In fact, it is found in virtually every religion and culture across history. The world’s religious traditions have long incorporated the circle into their symbolism, art, architecture and ceremonies. The circle is a very effective medium for promoting spiritual reflection, meditative insight and creative expression. We encounter this geometric form in so many aspects of our daily lives. Seasons and calendars are rooted in the motions of two lighted circles in the heavens – the sun and the moon. On earth, at least in flat places, the horizon is experienced as a circle. Because all points in the circle are equidistant from the centre of the circle and because there is no point on the circle that is more important than any other point, the circle has no hierarchy and is thus a symbol of equality. In the circle, “what goes around comes around.” Because everything in the circle is connected to everything else in the circle in a pattern of unity, the circle is also a symbol for reciprocity, mutuality and interdependence. The mandala also fits the human experience of the natural world. The bloom of a flower, the circle of the horizon, the dome of the sky, the zodiacal circle, and the cycle of the seasons have long inspired humans to reflect upon their place in the story of the universe. The ancient Greek philosopher, Empedocles (490-430 BCE), wrote: “The nature of God is a circle of which the center is everywhere and the circumference is nowhere”. The circle is a vital and central symbol in indigenous cultures around the world. It pervades most aspects of Native American thought and life because it represents a vital connection between the individual and creation. In indigenous cultures, the circle also represents unity, strength, protection, infinity, spirituality and the sacred. 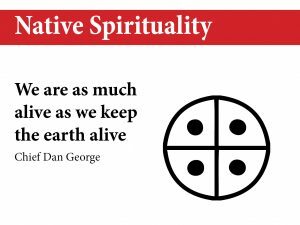 This explains why, among Native Peoples, the circle is so prevalent in spiritual practice, art, architecture, ceremony and social interaction. The sky is round, and I have heard that the earth is round – and so are all the stars. Birds build their nests in circles, for theirs is the same religion as ours. The moon does the same and both are round. and always come back again to where they were. The life of a person is a circle from childhood to childhood. Native American peoples conduct many of their activities in a circle. They remind us that in the sacred circle, everyone is equal. Further to this, Native spirituality teaches that when we sit together in a circle as equals, we have occasion to learn the way of humility. Many of the world’s religious traditions see the achievement of humility as a central goal of the spiritual journey. In modern times, there is a profound renaissance of interest in the circle. And this includes efforts to implement the circle as a method of social organization in numerous realms – e.g. healing, teaching, meditation/worship, dialogue, restorative justice, group reflection, group process, listening, the conduct of meetings and the sentencing of criminal offenders. Accordingly, authority resides in the circle – many people are finding the circle to be a welcome alternative to hierarchical, pyramidal or patriarchal models of authority. Compiled by Paul McKenna and J.W. Windland. Under the guidance of the facilitator, individuals work privately and in silence, making their way through the various steps of the given meditation. These steps are already outlined in each of the meditation exercises in this document. After completing the last step in the individual meditation process, participants work in pairs or groups of three, sharing their experience of and learnings from this exercise. Participants are encouraged to share as much as they feel comfortable sharing. Next, some of these learnings can be shared and discussed in a plenary session that includes all participants. During the plenary process, it may be helpful to record the learnings on chart paper and note emerging themes. The facilitator is responsible for providing the required materials and for creating and managing the schedule. The facilitator is free to make adaptations to the activity schedule suggested here. Choose an appropriate time for your meditation/reflection-a time when you will not be disturbed by other persons, the phone, the TV, and so on. Unplug your house phone and turn off your cell phone 10 minutes before your meditation. Do not reactivate your phones until a period of 10 minutes has elapsed after the meditation/reflection. It is likely that your meditation will be enhanced if, just prior to your meditation/reflection, you avoid distracting activities e.g. watching television. For your meditation, find a suitable place in your home or a favourite locale in nature. Take time to slow down your mind, your emotions and your body. You may want to do some deep breathing exercises, yoga or another form of physical movement. Or you may want to simply sit in stillness. You may want to light a candle and close the curtains in order to create a meditative atmosphere. Paul McKenna, MA, teaches, writes and consults in the fields of world religions and interfaith dialogue. Paul collaborated with a number of people in creating the Scarboro Missions Golden Rule Poster. Currently he functions as the Interfaith Coordinator for Scarboro Missions. Leslie Gabriel Mezei is an interfaith minister who regularly conducts The Universal Worship Service. A peace promoter and a multi-faith educator, Leslie has made a major contribution to interfaith networking in the Greater Toronto Area. Charles Purdy has committed his life to community service, peace-making and global justice. For the past eight years he has been involved with the work of Non-governmental Organizations at the United Nations. Currently he is involved in an effort to restore peace to Sri Lanka. Kathy VanLoon is a graphic artist and the editor of Scarboro Missions magazine. Kathy collaborated with a number of artists in designing the Golden Rule Poster. David Warren SFM, is a priest member of Scarboro Missions. David worked for a number of years in the Philippines. In recent years he has done academic studies in Islam, the Arabic language and inter-religious dialogue. He is committed to building bridges between Christians and Muslims. The methodology of this document has also been influenced by the work of Rev. John English, SJ (1924-2004) of Canada. English is recognized for his ability to adapt spiritual methodologies for group process.